Looking for Vandalism Suspects at Stratford High School and a parking lot on St. James Avenue | Crime Stoppers of the Lowcountry: 554-1111 | 1-888-CRIME-SC | Anonymous tips earn cash rewards with Crime Stoppers of the Lowcountry. The Goose Creek Police Department is searching for two people who were caught on camera spray painting a parking lot on the 200 block of St. James Avenue. The vandalism occurred on April 5 shortly after midnight. Officers also believe the pair is responsible for a vandalized sign at Stratford High School. 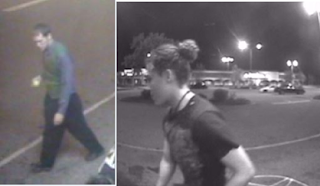 If you have any information on these people, the Goose Creek Police department is asking that you contact them at (843) 863-5200, Crime Stoppers at (843) 554-1111, or Investigator Hart at (843) 863-5200.